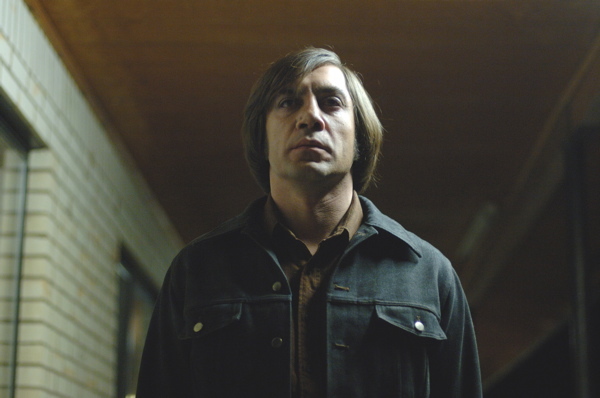 Javier Bardem, as the utterly psychotic Chigurh, is as monstrous a character I think I’ve seen and it’s telling that Tommy Lee Jones’ ‘good cop’ never gets to confront him (or it). The ending is bleak but you wouldn’t fancy the Sheriff’s chances so it could’ve been worse. I’m not a Coen bros. fan, something that never fails to generate amazement and distrust in my students; I think I agree with the charge that they are too clinical. However, this ‘distance’ is ideal for the rendering of Cormac McCarthy’s novel (his The Road, due out in N.America in November, is likely to be the bleakest movie of the decade). A word for Kelly Macdonald who invests her slight role with a depth that is striking in its pathos. Maybe that’s why it’s such a good film: its based on a good novel and has terrific acting (not forgetting Josh Brolin) so not even the Coen bros. could foul it up! This is an incredible rendering of Dylan’s life up until the ’80s. I’m not sure what sense it will make to those unfamiliar with this genius but watching the numerous seminal moments being re-enacted, with the original singing on the ‘track, made a riveting experience. Only the Gere as Billy-in-Pekinpah’s movie didn’t really work for me. And, as the Sight and Sound reviewer suggests, changing Dylan’s word’s in Judas moment in the Free Trade Hall didn’t make sense. 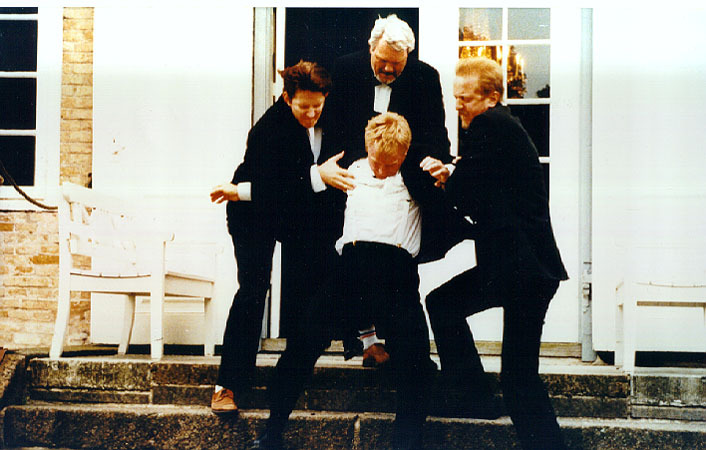 Casting six different actors in the role seems not to make sense but it works wonderfully. From the 11 year old black lad with Woody Guthrie’s guitar to Cate Blanchett’s Dont Look Back turn, all the players embody the Dylan-enigma with panache. 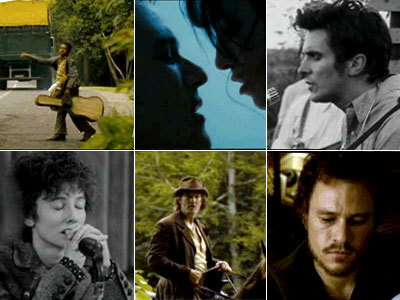 Another pairing of Heath Ledger with Christian Bale and here Bale can, too, show what a fine actor he is. It’s difficult not to love the movie if you love the music – there’s stacks of that – but this is more than postmodern playfulness. Maybe there’s trend as the last two postings have found something interesting in postmodern representations. This was the opening film in Bradford’s Bite the Mango film festival that opened on Friday and what a fascinating treat it is. 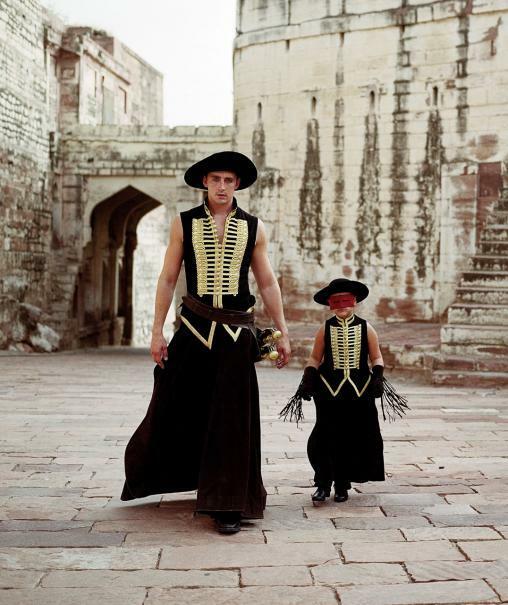 At first I thought it ‘drowned’ in its stunning visuals; it’s directed by Tarsem who, when he was suffixed by Singh, directed The Cell with Jennifer Lopez. However, its postmodern take on The Wizard of Oz proves to be a thoughtful narrative. Central to the film’s success is one of the most extraordinary performances from a child I’ve ever seen: Cantinca Untaru’s Alexandria is a marvellous mix of charm, ‘innocence’ and knowingness. According to http://antagonie.blogspot.com/2008/06/beautiful-minds.html the film was built, in part, from her improvisations. The word ‘postmodern’ above might suggest it’s all playful and superficial surface but the film does address interesting issues about children’s fairy tales. The attempt to link this to Hollywood doesn’t quite work but anything that reminds us of Keaton, Chaplin and Lloyd works for me. It’s on release in the UK on Friday 3: go see. Animation’s starting to get the ‘adult’ appreciation it deserves; as are graphic novels. Marjane Satrapi’s graphic autobiography forms the basis of this excellent film. If ever the political was embedded in the personal then it’s in lives that live through revolutions; the Iranian one in ’79 in this case. By focusing upon the travails of a young girl growing up, the distant events become engaging. The animation, drawing directly from the original, is terrific. This hectoring teachers become serpents; her unfaithful boyfriend is transformed from a ‘blond hunk’ to a zit-ridden nerd. The ‘mullahs’ come out of it badly; but certainly no worse than the British and Americans. It’s how Satrapi saw it and her vision rings true.